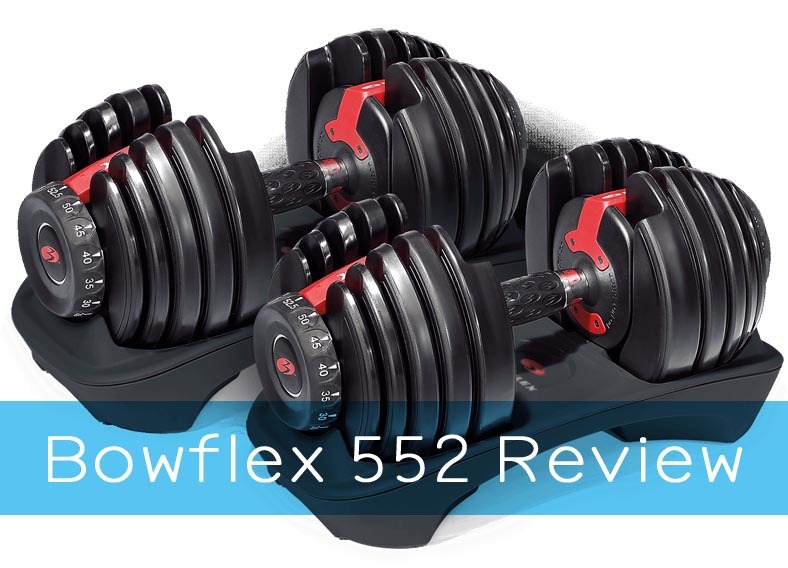 Home » Dumbbells » Bowflex SelectTech 552 Dumbbells – Is It Worth Your Money? 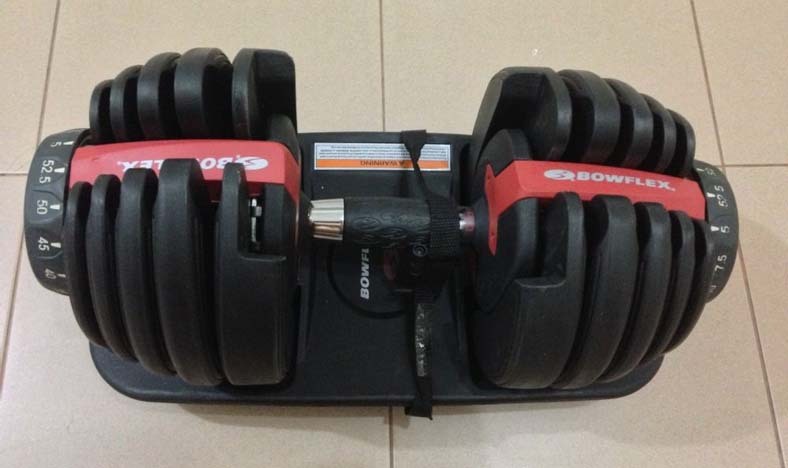 Bowflex SelectTech 552 Dumbbells – Is It Worth Your Money? Purchasing fitness equipment online can be a tough task, especially when it comes to dumbbells. However, when it comes to the Bowflex Selecttech 552 Adjustable Dumbbells, we’ve made the process a lot easier. Why would you be interested in using these dumbbells? Well, for one, if you are a physique aficionado, then it is only natural that you would want something which will offer the best results. Having said that, we feel the need to elaborate all that we know about the product itself. In fact, we will be doing an entire rundown, trying to cover all the nitpicky details to bring you a clearer picture of your purchase. Finally, we will leave it up to you to make the final purchase decision. When you first take a look at the dumbbells, they seem to be on the stylish side. The black finish complements the red accents. In fact, the support blocks also add to the overall aesthetics of the design. So, aesthetically, there are no complaints. And yes, the Bowflex 552 does come with weight brackets. Because of the inclusion of such smart technology, your exercise area remains a lot cleaner. But the overall shape and size will help save some of your workspace space. Coming in at 15.8×7.9×9.1-inches, you can easily understand what we have to say here. Moreover, having a Bowflex Selecttech stand with a media rack will not only add some aesthetic values but will also take up very little of your exercise space, which is certainly a concern these days. In the case of quality, Bowflex doesn’t really like to make any compromises. In fact, it is safe to say; you are getting what you pay for. When it comes to the overall build quality, there isn’t much to complain about. The metallic parts paired with the rubber protection will certainly withstand a lot of heavy lifting. You should be fine even if your workout routine is intense. Also, do take note that the high-strength metal structure offers a decent amount of usability, as the user won’t have to deal with any disk rattling. All in all, the design features a sturdy build with very little room for complaints. Moreover, while trying these out, the grips felt superior to some of the existing brands out there. The rubber coating feels fantastic to hold in your hands, which isn’t something that can be said about all dumbbells. We liked how you get the opportunity to choose between 5 and 52.5-pounds, with a 2.5-pound adjustment increment of up to 25-pounds. If you have a chat with your training buddies, you may find the weight range to be a fairly standard one. It is probably safe to say; most enthusiasts will find the Bowflex 552’s to be adjusted by the standards. As we mentioned before, using the dial-in weight system is pretty easy and it doesn’t take long at all to get used to it. The 552s are pretty well-balanced to enhance your overall physique. If you are looking to take care of those biceps, triceps, and shoulders, the 552s have you covered there as well. The smaller weights will be a much better choice for such improvements. But if you want to work on your lower body parts, then you may want to work with a bit more weight for better results. Because of the 552s standard weight range, it’s not hard to get going. Also, knowing the weight limits as per age preference will allow better growth of your body. For example, novices should start with no more than 10-pound weights. As one progresses further, increasing the weight limit to around 15 to 20-pounds shouldn’t be an issue. Finally, if you are someone who is already working out at an advanced level, dealing with 30-pounds or more shouldn’t be an issue at all. You may want to increase your weight limit gradually for exponential results. The weight distribution system of the Bowflex 552’s is indeed something to have a better look at. The dumbbells feature a unique dial system to help you choose your desired weights. As you are already familiar with the weight range, it is only logical that we dive right into the dial systems ins and outs. It works something like this; the weights are all grooved as disks. The dial’s numbering represents the amount of weight you want to work with. Then, as you dial your desired weight requirements, the bracket that runs along the top will only grab the desired weight plates and leave the other plates on the dumbbell block. This system is more desirable for two reasons. Firstly, you are dealing with a cleaner exercise space. 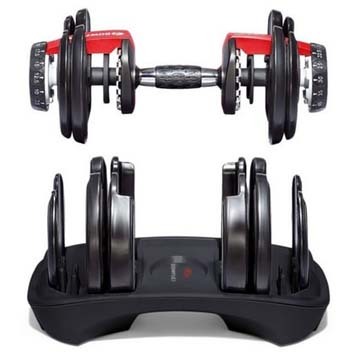 Secondly, the weight distribution remains incredibly accurate compared to many other adjustable dumbbells. Now comes the million-dollar question. For starters, the weight range is well up to the standards, there’s no doubt about that. Pair it with the overall smooth and sturdy build quality, and there you have the perfect combination of quality, control, and comfort. In addition, the weight distribution system is something of a critical feature of the 552’s. As a matter of fact, most dumbbells don’t feature smart systems like these to make your job a tad bit easier. For instance, you’re able to workout in a space that won’t be cluttered with different dumbbells. Instead, you have all the weights you need on just two dumbbells. Taking all matters into consideration, our recommendation would be to go ahead with the purchase. The pricing does make a fair bit of sense if you compare the overall features. Also, there is that design aspect which will add some flair to your exercise area. All in all, we feel confident in recommending it as a worthwhile investment for anyone looking to workout with weights. The Selecttech 552’s come with a 2-year warranty, both on parts and labor. Products like these typically don’t offer such a warranty period. But it seems that the vendors are really satisfied with what they have assembled for the exercise junkies. Which brings us to the second thing we want to shed some light on. It is only natural for you to have different exercise preferences. Maybe you feel like the Bowflex 552 aren’t really matching your style and routine. The vendors have got you covered here as well. In case you don’t like what Selecttech has to offer, you get a 6-week Fitness Result Guarantee with your purchase. The confidence level does indicate some level of superiority from the vendor’s end, as they are willing to pay a full refund if you don’t like the 552. All in all, the 552 have proven to be a fantastic addition to your personal gym. Even if you aren’t sure, Bowflex provides you with the peace of mind in knowing that there’s a 2-year warranty. In order to help you understand all the features, it is only fair that we provide an in-depth comparison to help you out further. The comparison section below will help to highlight the features of the Selecttech 552’s even further. The Selecttech 552s feature a weight range up to 52.5-pounds, which is mostly considered as a standard by many. But if you are looking to take your work out to the next level and lift heavier weights, 1090 may be a better alternative. You can quickly adjust them from 10 to 90-pounds. The lower weight with the 552’s isn’t necessarily a downside. They are just more suitable for people who aren’t going to be lifting any heavier than over 50 lbs. When it comes to weight adjustments, 1090 will offer a 2-pound increment up to 90-pounds, whereas you are getting only an adjustment range of 52.5-pounds, with a 2.5-pound increment right till the end. For someone who is willing to build up a robust lower body, the 1090s should offer a significant amount of usability for those folks. But if you want to concentrate on a full body routine, then we would recommend you go with the 552s as they offer better muscle toning overall. Both the Bowflex 552 and 1090 feature the same dial-in design for weight adjustments. As we have mentioned before, systems like these offer much better flexibility and weight distribution. The Powblock Elite Dumbbells we have here can easily take your weight limits from 5 to 50-pounds. In contrast, the Bowflex 552 have a have a slightly better weight range, which is only a mere 2.5-pounds compared to the Powblock. The Powblocks use a distinct locking mechanism to make room for 16-dumbbells, eliminating the need for any extra space. On the other hand, the Bowflex 552s dial-in mechanism allows for the same additional room elimination as well. But the dial-in techniques seem a lot better compared to the locking mechanism in the Powblocks. Also, take note that the Powblock dumbbells offer a 2.5-pound increment which is similar to the 552. But the weight adjustment mechanisms may make or break the deal for you. It is something the Powblocks can handle much better. The Powblocks do have the ability to be expanded to 90-pounds because of their design. On the other hand, there are no such expandability options for the 552, which is something to consider. The build quality feels durable. Switching from one weight to another is relatively simple. Features a unique dial system to eliminate additional weight systems. Weight range and adjustability are both satisfactory. The typical long size is a deal breaker for some folks. If you are wondering how on earth you will settle your mind, you will find the section below very useful in making the process a lot easier. We are about to give you some tips on how you should make your purchase decision. Be advised; these are the basic instructions from our point of view. But for the sake of simplicity, we won’t be diving into any more extensive details. First of all, it would be better for you if you stick with flexible options. 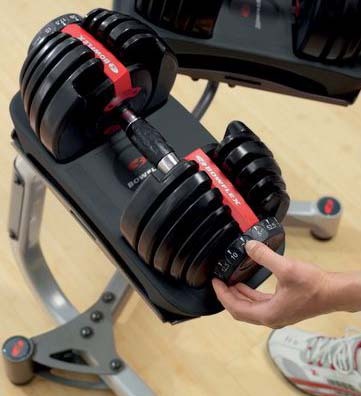 Adjustable dumbbells offer a lot of headroom when it comes to storage and flexibility. In some cases, you may even get the option to expand your weight capacity. Second, it is better to know your routine. If you are a heavy user, then you should probably go for high-end options. The reason behind it is simple, the more cash you have, the more likely it is that the product you buy will be more durable and of a higher-quality. 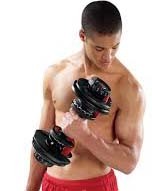 So we have made the list of top adjust dumbbells to help you make a decision. Third, never overlook your comfort levels. If you pick up a product which doesn’t feature your favorite type of grip, then you are wasting money. So, your personal requirements do need attention. Finally, having some gear like a set of gloves, mat, and bench to have that overall satisfaction you were always looking for can help your home workouts to feel complete. Having such accessories may vary from person to person. So, if you don’t think you need them, you don’t need them. But having such accessories is a plus for most people trying to motivate themselves to workout from home. 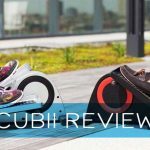 Our key focus of discussion here was about the Bowflex Selecttech 552s, which will undoubtedly offer you a lot of usability and flexibility overall. In fact, considering all the facts on the table, we can safely say that you won’t regret your purchase if you plan on having a set of these lying around the gym. But there is always room for doubt. For this reason, we have tried to compare the 552 to some of the existing products, carefully marking the dissimilarities. Also, having a buyer’s guide along the way is an added bonus to help you decide whether these dumbbells are right for you.